Heroic army soldier carrying his fallen fellow in arms from battlefield during military operation. Army paramedic evacuating body of dead comrade from combat, carrying him in his arms. 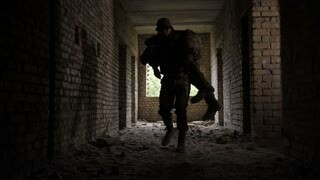 Army soldier saving life of injured brother in arms, carrying unconscious friend on his shoulders in abandoned building. Brave marine carrying wounded comrade on his back, evacuating from battlefield. 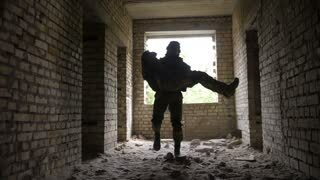 Brave military medic evacuating wounded fellow from battlefield, carrying him on his shoulders in ruined building. Army soldier saving life of wounded and unconscious comrade during combat. 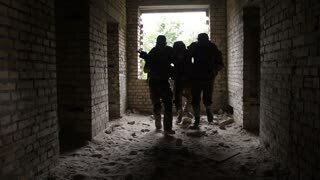 Rear view of army soldiers evacuating injured fellow from battlefield during rescue operation in abandoned building. Wounded combat soldier is carried to safe place by army paramedics. Grief-stricken army soldier with weapons in camouflage sitting on his knees near fallen comrade in arms during combat. Military marine in sorrow for lost fellow screaming and blaming sky for casualty. Special forces marines evacuating dead body of brother in arms from battlefield during military operation. Army rangers with weapons dragging away fallen soldier from combat. Focus on soldiers legs. 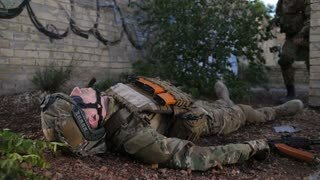 Squad of special forces rangers with combat shotgun rescuing injured and unconscious soldier from battlefield under enemy fire. 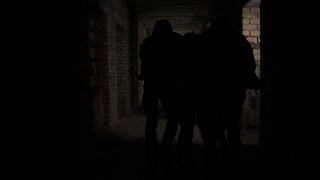 Army medics dragging wounded fellow away to safe place during combat. 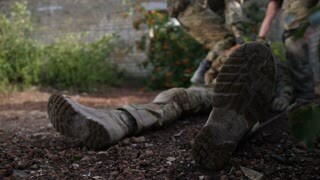 Special forces ranger fully equipped and armed dragging away fallen soldier from battlefield during military operation. 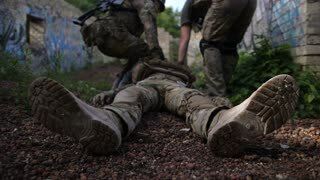 Army soldier evacuating dead body of killed brother in arm from combat. Heroic army ranger medic in uniform saving life of wounded brother in arms, dragging him away to safe place during combat. 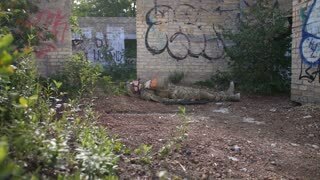 Army paramedic evacuating injured and unconscious comrade from battlefield.